Mumbai, 15th February 2017 Badrinath aka Varun Dhawan and his beautiful dulhania Alia Bhatt took frustrated Mumbaikars, stuck in traffic by surprise this Monday. 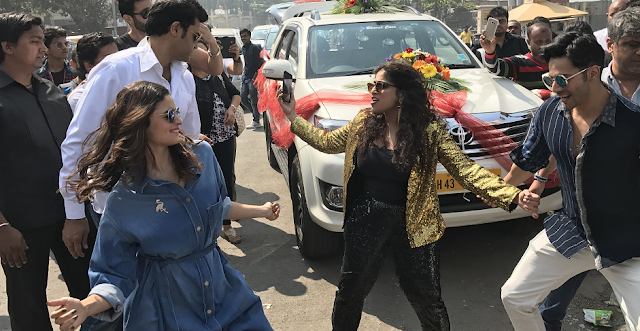 Red FM’s RJ Malishka along with the stars decided to spread some happiness on Monday morning when they went on to the streets of Mumbai and made the people dance to the tunes of ‘Tamma Tamma’. The ‘tour’ began at Bandstand where Varun, Alia and RJ Malishka along with their gang exited a car began to perform. People were astonished to find themselves suddenly amidst celebrities who had actually come to dance with them. Alia and Varun encouraged the crowd to join in and what one witnessed was a huge mob of excited citizens. The vehicle then went on to pump up the air in areas around National College giving the students something to smile about on the usually mundane first day of the week and ended with a last dance at base outside the Dharma Productions office. “Red FM as a brand is associated with a lot of causes like curbing traffic and noise pollution however entertainment is our key forte. Our emphasis has always been to entertain our listeners with 360 degree touch points, be it on air, on ground or on line. This activity was intended to live up to the spirit of Bajaate Raho and to reflect the irreverent brand we have always been. Our brand associations are strategically done to reinforce the ' station for expression ' promise and key Bollywood associations are a must have in our content planning,” said Nisha Narayanan, COO, Red FM. A number of people got out of their cars and shook their legs to the beats of Badrinath ki Dulhania’s latest song ‘tamma tamma’ which is slowly catching on as the number one song on all party playlists. The Red Tamma Tamma Mob as they came to be called thoroughly enjoyed their morning workout with the cast of Badrikanth ki Dulhania and of course the super fun RJ Malishka. We don’t think Mumbaikars could have asked for a better start to their day. We are Irreverent; we are young, cool and trendy. We are the voice of today’s Millennial. We are one of the largest radio networks in the country. We are Red Fm. Based on the internationally successful CHR (Contemporary Hit Radio) format we play only Super Hit music. With the brand philosophy and attitude that is ‘Bajaate Raho!’ at Red FM we always speak up for the right, for the people. Our listeners are at the heart of everything we do and so we are called the ‘station for expression’ by establishing an emotional connect with them. We do things differently, we don’t follow the herd and it’s testament to the fact that Red FM boasts of over 169 award winning campaigns including BEST BRAND, BEST FM STATION & BEST RJs. It’s our constant endeavour to unbox the brand Red FM and take it far and wide amongst the listeners and so we have successfully established our independent vertical extensions RED Mobile, RED Live, RED Digital which endorses the same brand language.